Guardians Of The Galaxy was the title on everyone's lips this weekend, as Marvel and James Gunn have scored themselves an easy home run for the Marvel Cinematic Universe. More importantly though is the fact that Gunn's story is similar to Joss Whedon's story back in 2012, when The Avengers became the super hit that we all know and (most of us) love to this day. A director once on the fringe of geek and indie culture was given the keys to a Marvel property and if the response is anything to go by, this is another one out of the park for Kevin Feige and Marvel Studios. #GuardiansoftheGalaxy made more in midnight screenings than my last two films domestic totals combined. Thx @Marvel for taking a chance! This past Friday, E! 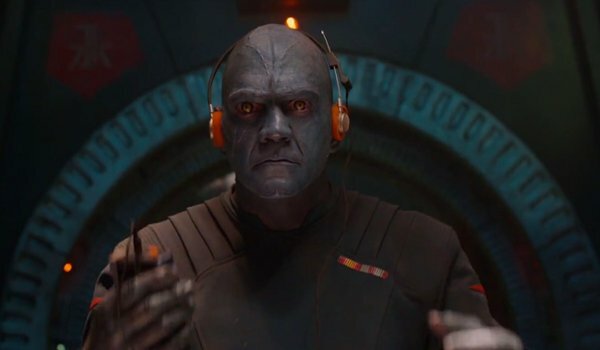 Online ran a Twitter Q&A to celebrate the opening of Guardians Of The Galaxy, and they solicited fan questions from all over the internet, asking about everything from how he's responded to the outpouring of fan love to how he chose the music for the film. The result was a very open and honest celebration of James Gunn's rise to the toast of the nerd kingdom. Short of pouring over the entire session (which you should totally do), you can always read the five facts we thought were the most interesting here! Guardians Of The Galaxy has a bit of a retro vibe to its futuristic nature, courtesy of the fact that Peter Quill/Star-Lord left Earth during his childhood. So naturally, he loves a certain era of popular music that left audiences "hooked on a feelin'" after the film started to advertise itself. Of course, that's not the only classic cut on the Awesome Mix Vol. 1, with hits from David Bowie, The Runaways, and even The Raspberries all making an appearance on the playlist of the stars. So how DID James Gunn put together an album that sounds like an accurate representation of someone who grew up in the 70's/80's, while avoiding the pitfall of sounding like a Time Life compilation CD? "Made a list of 500 70's hits, whittled it to 120 & chose from that. I wrote all songs except 1 into the script." Speaking of Rocket Raccoon, an interesting fact came up when Mr. Gunn was asked about his favorite scene/line from Guardians Of The Galaxy. When it comes to his favorite line, his answer is Rocket's crack about, "A bunch of jackasses in a circle." The funny thing is, that line didn't come from his own mind, or even the mind of co-writer Nicole Perlman. 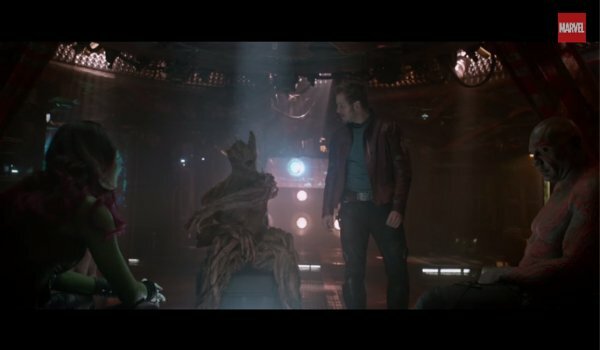 The line was improvised by Sean Gunn, James's brother, who was also the on set actor for Rocket and is a frequent collaborator with the director. As for his favorite scene, it shouldn't be a surprise that his pick was the one that contains his favorite line: the "12% of a plan scene." Of course, Sean Gunn is not the only member of the Gunn repertory company in the film, as Gregg Henry, Nathan Fillion, Lloyd Kaufman, and (of course) Michael Rooker all have roles within the film. It's good to see that no matter the budget, no matter the story, James Gunn makes room for collaborators that he trusts implicitly. You can clearly see his signature style in Guardians Of The Galaxy, only this time it's been passed through the filter of a bigger budget and a bigger scope. Neither stop the film from feeling like a genuine article from the Gunn catalog, and with work on the sequel already underway, we can probably expect more brilliant collaboration from Mr. Gunn and friends. 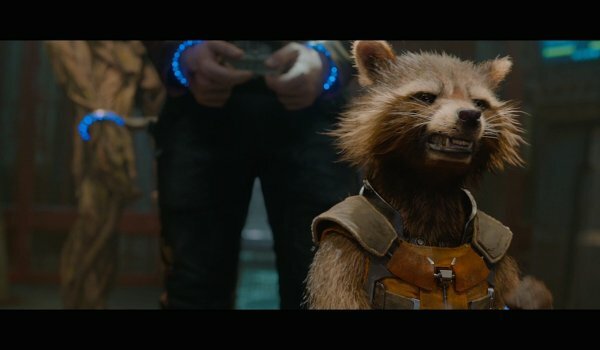 Bradley Cooper's Rocket Raccoon was the pre-ordained breakout star that everyone was looking forward to seeing in Guardians Of The Galaxy in the months leading up to its release. Among the character's supporters was James Gunn, who upon nearing completion of the film stated that he was sad to see the character go. When asked which character he identified with the most in the film, his answer was not only the most obvious one, but it was also very insightful as to why he (and maybe some of the fans in the audience) love this character so much. "He has anger issues like I did as a young man. I relate to how much of an outsider he feels like." As a writer, it's hard to write a true ensemble piece when you identify that much with a character. However, seeing as each of the Guardians has their own issues with anger and loss, it must not have been that hard to equally distribute the action between characters. Still, seeing how much Gunn enjoyed the character (and the real life animal that served as a reference model,) it's no secret as to why everyone loves Rocket. For a character that must have had a lot of people scratching their heads once the project was announced, it just goes to show that if you really put the time and effort into it, you can make the world believe a talking raccoon. ...can't give it away but there should be at least one more Guardian from the comics. If telepathy worked on an entire crowd thinking the same thing, the word "Nova" would probably be sending shockwaves of energy at this exact moment. After discounting that obvious non-starter (considering Gunn isn't a fan of the character,) we don't really have that many good leads as to who would join up with the rest of the team. 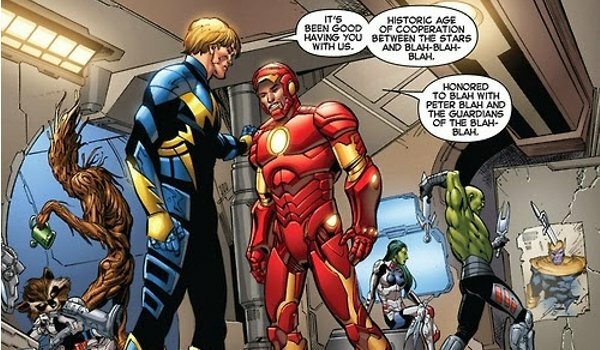 Of course, there's always the option that James Gunn could bring in studio favorite Iron Man in the run up to The Avengers 3, thus cementing the path to the Infinity Gauntlet storyline. OK, a warning must be issued for our final point of order: It's a huge spoiler for the post credits scene. If you haven't seen the film yet, then you can come back after you've had a chance to partake in the glory. 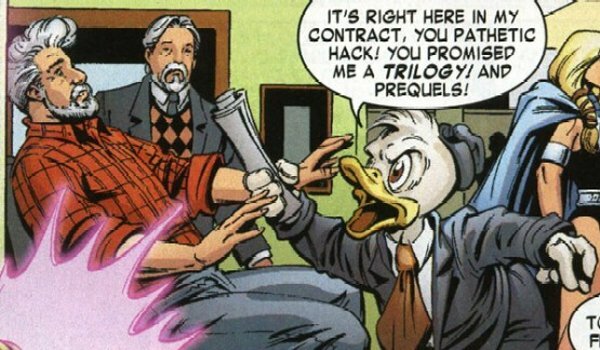 By now you've either seen or heard about the fact that Howard The Duck (voiced by Seth Green) popped up in the Guardians Of The Galaxy post credits sequence. Which naturally has a lot of people who remember the 1986 box office bomb wondering if history is going to repeat itself. Considering that most (if not all) Marvel Studios films contain a tag that leads to the universe of the next film in line or enriches the world of the current one, it's not a huge leap. By the sounds of it, it doesn't look like we'll be getting everyone's favorite foul mouthed waterfowl just yet. The end tag was just me having a bit of fun. At the end of the day, we don't take ourselves too seriously. It seems like James Gunn just used a Marvel Cosmic character as a punchline, rather than a franchise starter. After all, Guardians Of The Galaxy seems to be the only franchise the director has eyes on for the moment. Though, to be fair, it'd be really nice if Marvel Studios could somehow reboot the character into a theatrical franchise that doesn't reek of desperation like the original. Not to mention, Gunn got around some colorful moments himself through clever gags that covered the more obscene parts of the film. Still, a duck that like to drink, swear, and sleep with women isn't exactly a film that begs for a line of stuffed animals. Though it doesn't seem too out of line for the character to pop up in a more substantial role in Guardians Of The Galaxy 2, considering how Gunn included him in a friendly enough context. James Gunn has officially arrived with the blockbuster success of Guardians Of The Galaxy, and with work already starting on the sequel, it won't be too long before we get to go back to the world of Star-Lord, Gamora, Drax, Groot, and, of course, Rocket, once more. Guardians Of The Galaxy is in theaters now, with a sequel slated for July 28, 2017!